Stem CAPtain make a range of products that are undeniably useful and conveniently located. A Stem CAPtain replaces the top cap on your steerer tube (above the stem) of your bicycle allowing you to glance at your compass with ease. They can be easily installed in about a minute and attract quite a bit of attention due to their unique design; an idea that surprisingly nobody else has come up with. 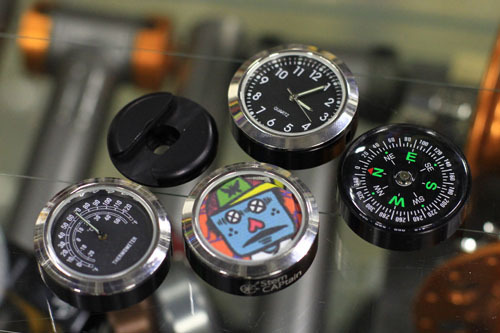 Available in their arsenal of products are a clock, thermometer, bottle opener, picture frame and compass. 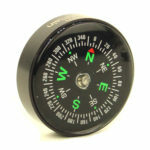 I purchased the Stem CAPtain compass from a bike shop in Melbourne, where I was advised that they hadn’t actually seen any compass model that worked as described. They offered it to me at a price worth giving a go, and as I played with it on the palm of my hand (it seemed to work) I grew more excited at the prospect of having this little device riding astride my steerer tube. I thought about all of its usefulness on a touring bike in foreign cities where a deceptive curve in a road is enough to throw out your sense of direction. I got home, pulled out the existing stem cap and bolt, replaced it with the new Stem CAPtain and went for a quick spin. Does The Stem CAPtain Work? Well… no. At first I thought it was fine, but after clocking up a few hours the conclusion is that it simply doesn’t. According to Stem CAPtain, “bumps, bouncing and road vibes will normally make the compass align correctly while riding”, but even on poorer road surfaces, I didn’t post any accurate results. I did notice that overnight, the compass righted itself, the needle worked back to the right location. The tilt of the bikes head-tube angle didn’t help. Setup included using the compass inserted all the way into the top cap cup. After that gave me barely any accuracy, I adjusted the tilt so that the compass sat parallel to the ground. This improved the accuracy marginally, but the new location still did not an effective compass make. The compass quickly developed air bubbles. I would’ve only had it for 3-4 days when the compass developed a decent number of air bubbles. The air bubbles affected the compass’ needle’s ability to move smoothly – to the point where it was wildly inaccurate. And nobody needs a compass that shows a complete disregard for practicality. 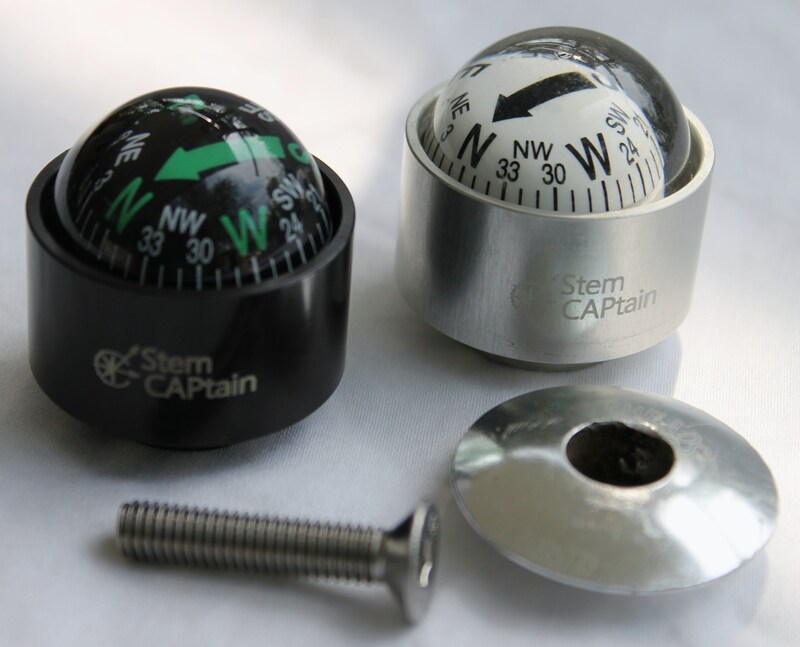 It is worth noting that Stem CAPtain provide the compass with a de-magnetised bolt to minimise any interference with magnetic fields. I think this is the least of their worries. I was riding home on my regular commute. It was a beautiful sunny afternoon with marvellous blue skies. I had already given up on the compass by this stage and was planning on removing it from my bike to keep in the archives. But the unimaginable happened: the Stem CAPtain decided to put itself down by ejecting from my bike of its own accord! I am not a litterer however, and I spent the ensuing 10 minutes looking on the road and the verges for the little compass whom I would’ve liked to love. Clearly, the shame it had brought to its owner was just too much to take – it was long gone. I felt guilty as I had left that rubbish somewhere on the road, but also happy to save some time in the Stem CAPtain removal process. 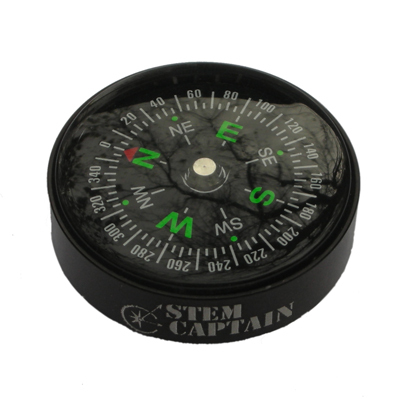 August 2012: Stem Captain have just informed me that they are ready to ship a new version of their compass, the Compass 3.0! I haven’t sorted out an opportunity to review the compass yet, however, I have been assured that the spherical design is working really well for them. You'd be wasting your money if you purchased one of the Stem CAPtain compass 2.0. It is a great idea and location for a compass, but it just doesn't work. Not all is lost though. Through the Stem CAPtain trial process, I ended up buying a well-functioning orienteering compass to keep in the map reader of my Ortlieb Handlebar bag.